Some FBOs will fill up the tanks of each of their aircraft so that the next customer show up to a full tank of fuel. To be simple, the "wet" rental rate just means that a fixed fuel rate is already factored into the cost of the rental. Remember that aircraft rental is a service and not taxable, but fuel and oil is a taxable commodity so that the total bill will reflect the added tax on fuel and/or oil. Established FBOs and flight training organizations often utilize a wet rate to make things easier for everyone involved. It's easier for the flight school personnel to keep track of the fuel in their fleet of aircraft when they're the ones personally filling up the fuel tanks and running the fuel trucks. If a pilot needs to get fuel while on a cross-country flight for an aircraft rented on a wet rate, he or she would typically pay for fuel out of pocket and then be reimbursed by the FBO or flight school upon return. Many FBOs also include a gas card with the aircraft rental, with the stipulation that the pilot fills up at a certain airport or FBO that offers a particular rate or even incentives or rewards. In contrast, a dry rental rate does not include the cost of fuel or oil in the rental rate. A pilot renting an airplane at a dry rate will pay for fuel and oil himself, as needed, separately from the aircraft rental rate. The advantage to renting at a dry rate is that fuel-efficient pilots may end up paying less or fuel than other pilots who don't use fuel savings techniques like leaning the mixture aggressively. A dry rate encourages proper fuel management and the leaning of the mixture control to save fuel, which can also save on maintenance-related issues. And with a dry rate, the pilot can often fill up at a cheaper rate at a different airport or fixed base operation if he wanted to save even more money. 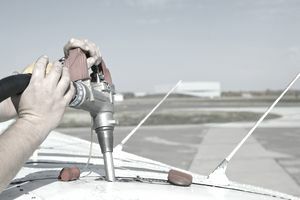 One of the disadvantages of a dry rate can be showing up to an empty airplane or having to take the extra time to refuel at the self-serve pumps before returning the airplane. Flight schools and flight clubs often use a dry rate for aircraft that frequently fill up away from the home airport. It encourages the operators to save fuel. In comparison, it costs the FBO less, in the long run, to do it this way, because, with a wet rate, pilots often get fuel based on convenience instead of price, leaving the FBO to foot the bill for costly fuel reimbursements. There are advantages and disadvantages to each type of rental rates. Pilots who understand what each type of rental rate means will be able to plan to ensure they're getting the most value for their money. There are other things to consider such as variable costs and fixed costs.